If knowledge is power, and strength is found in numbers, then informing the sector with data, knowledge and contacts is an important part of advancing the craft sector. The following resources are intended to empower you. At the CCF/FCMA’s 2018 national crafts conference in Nova Scotia, “Placemaking: The Unique Connection Between Craft, Community + Tourism, Lunenburg Keynote Speaker, the Honourable Senator Patricia Bovey, gave her speech, Identity: Artists, The Senate & Canada. Click here to read it, and download our graphic below featuring a few highlights from her speech. From October 19th to the 21st, 2017, the CCF/FCMA participated in the exclusive Craft Think Tank on Craft Education, hosted by the American Museum of Ceramic Art in Pomona, California. For three days, thirty five delegates (each in attendance by invitation of the organizers) exchanged information and ideas about the state of craft in America. Read through our report on the event, and be immersed in the many resources, references and ideas shared throughout the event. Craft Year 2015: the biggest, broadest celebration of contemporary fine craft ever hosted in this country. It’s not just a claim, we have the stats to back it up! Throughout the year, craft artists, institutions, associations and the general public took part, attending a record-breaking 884 events, up 25% from our previous number during Craft Year 2007. Find out more about what events took place and where, as well as the online Craft Year experience, in our Craft Year 2015 infographic. The CCF/FCMA is proud to bring you this visual research compiled over the course of 2015. As an organization of organizations, we know the value of networking and collaboration, and that the impact our members make helps to define the craft community. ‘Craft Councils at a Glance’ showcases the scope of the councils and their work. This paper articulates the Canadian Culture Satellite Account (CSA) developed by Statistics Canada. 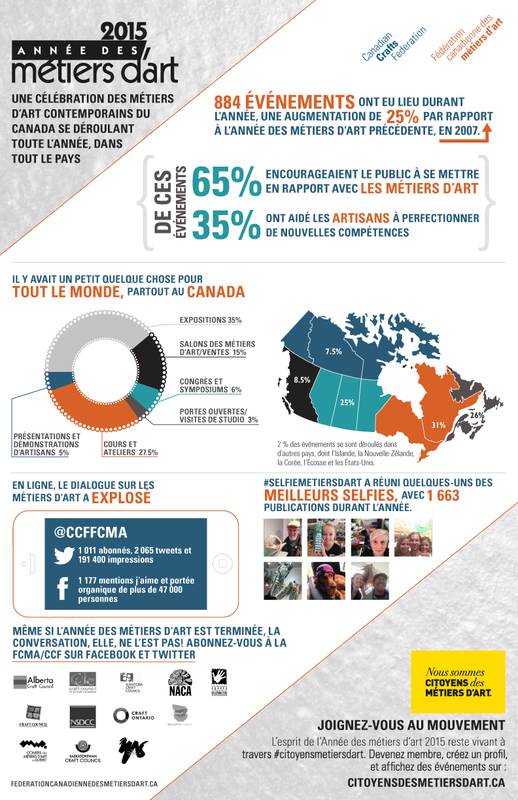 The Canadian CSA provides measures of the economic importance of culture (inclusive of the arts and heritage) and sport in Canada in terms of output, gross domestic product and employment, for reference year 2010. The biggest take-away from the report is: that culture represents $47.8 billion worth of GDP, and of that total, $2.8 billion is attributed to the Craft sector. 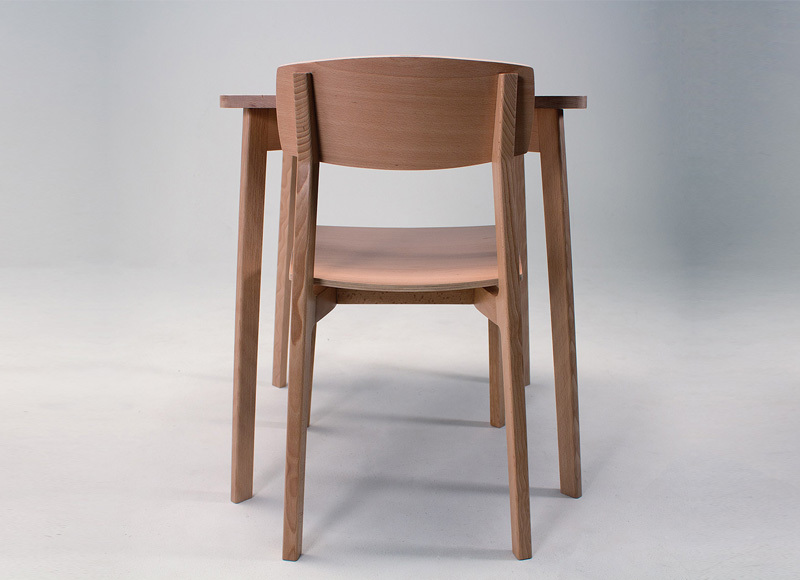 A Study Coordinated by Conseil des métiers d’art du Québec (CMAQ) for The Canadian Craft Federation/Fédération canadienne des métiers d’art (CCF/FCMA) and prepared by Bert Pereboom, Peartree Solutions Inc., October, 2003. 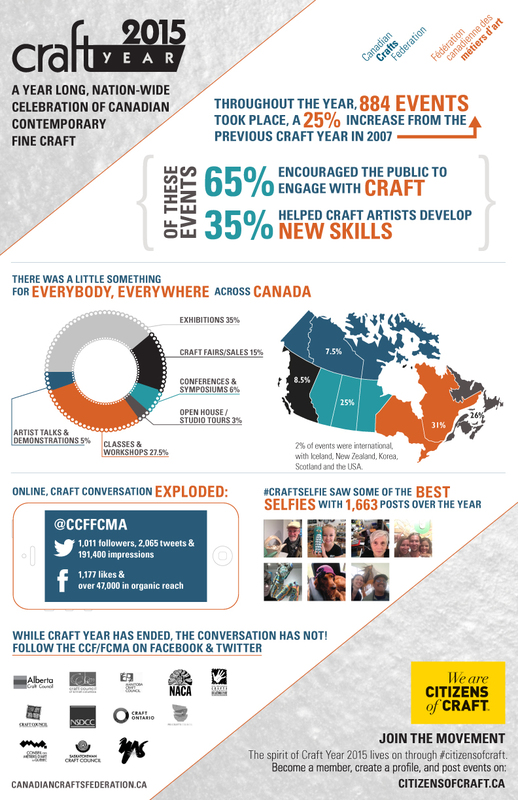 This study provides a qualitative and quantitative profile of the craft sector in Canada. It is the first study to utilize a consistent methodology to measure craft activity across Canada. The study was also the first attempt to develop a cohesive domestic and international development strategy for the craft community in Canada. It reveals that the sector is largely populated with skilled craftpersons working in home-based and other small studios producing one of a kind work or production work. Craft activities are estimated to support some 22,600 individuals, generating total output valued at $727 million, and exports approaching $100 million dollars annually, representing 16 percent of craft revenue of the survey respondents. The Vancouver Island University has released a study on what they are calling ‘Traditional Craft Trades’ and the role they play in protecting Canada’s heritage. An interesting take on craft, which includes artistic practices as well as the more agriculturally tied craft activities, the study concludes with more questions we should all consider. (Unfortunately, this study is only available in English). Initiated by the Trade and Investment Development Directorate of the Department of Canadian Heritage, in cooperation with the Trade Team Canada Cultural Goods and Services Working Group (TTC-CGS) for Crafts, this study focuses on the niche connections in crafts. It identifies the trends, habits, experiences and conditions of Canadian fine craft exporters, as well as the niche market opportunities with particular potential for Canadian fine crafts people. Prepared by Heather O’Hagan, former Executive Director Crafts Association of BC, for the Department of Foreign Affairs and International Trade. Funding provided by the Department of Canadian Heritage, The Canadian Consulate in New York and International Trade Canada. This report offers detailed information and observations about the Buyers Market from a Canadian participant’s perspective. Developed by Tom McFall, Executive Director of the Alberta Craft Council and Chair of the Trade Team Canada – Cultural Goods and Services Working Group for the Craft sector; Anne Manuel, Executive Director of the Craft Council of Newfoundland and Labrador; Louise Chapados, Director of Development for Services and Exports of the Conseil des métiers d’art du Québec; Rosalyn Morrison, former Executive Director of the Ontario Crafts Council; and Susan Greene, former Senior Trade Officer responsible for Craft with the Trade Routes program of the Department of Canadian Heritage. 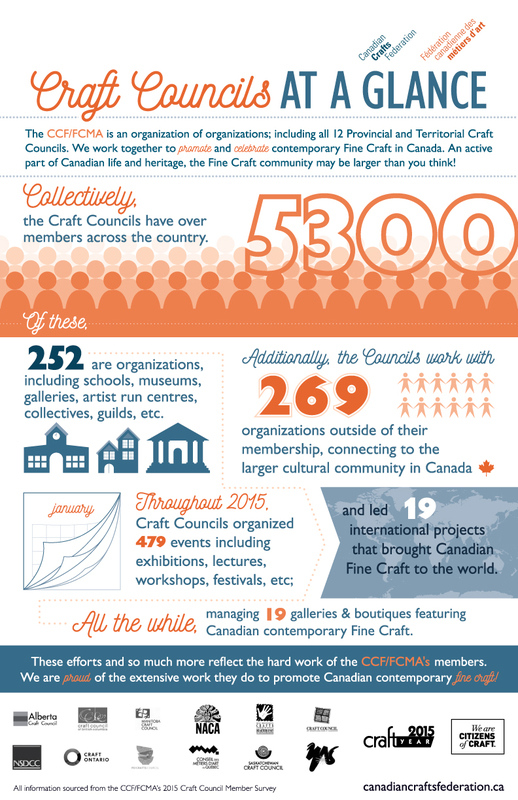 Based in large part upon the research and findings presented in the document “Profile and Development Strategy for Craft in Canada,” (see above), the scope of the action plan is limited to recommendations for action on the part of the Government of Canada. Commissioned by the Department of Foreign Affairs and International Trade in 2002. Managed by the Crafts Association of British Columbia, co-authored by Dana Boyle, Business Development Officer with the Canadian Consulate General In Minneapolis, Minnesota, and Lou Lynn, artist and faculty member at the Kootenay School of the Arts in Nelson, British Columbia. 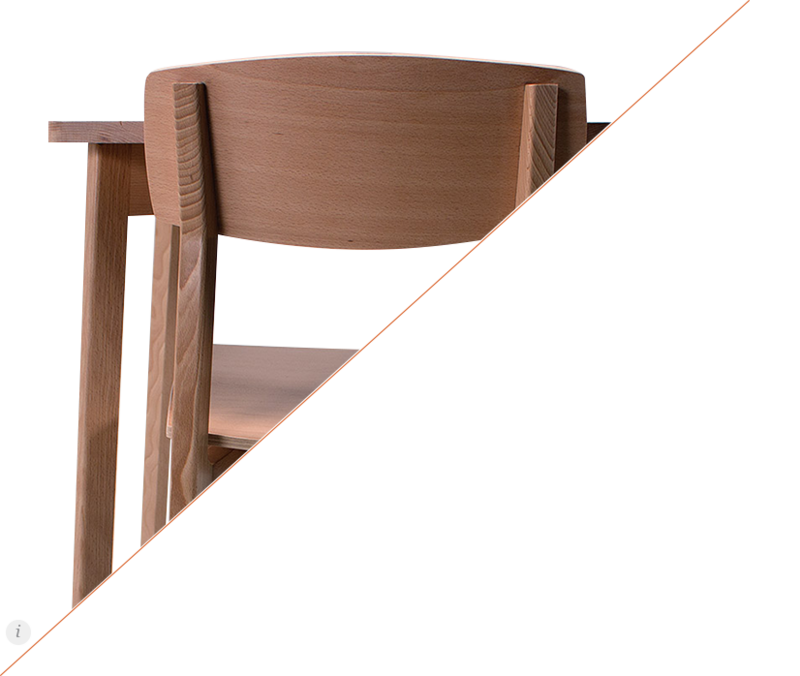 The guide is a source of information for craftspersons interested in entering US markets or expanding their US exposure. Topics include: Getting Ready to Go, Working with Galleries, Preparing to Export and Border Issues. Also included are: tips for preparing portfolios; advice about approaching US galleries; descriptions of wholesale and retail shows; and more. Find recommendations for converting your prices for selling in the US market, classifying your work for US customs, finding customs brokers, shipping, working with embassies and consulates, and much more. Coordinated by Conseil des métiers d’art du Québec (CMAQ) for the CCF/FCMA. Prepared for Industry Canada and the Department of Foreign Affairs and International Trade (DFAIT) by Bert Pereboom, Peartree Solutions Inc.
CARFAC (Canadian Artists’ Representation/Front des Artistes Canadiens) is a national nonprofit group dedicated to defending Canadian artists’ economic and legal rights. They also direct research and promote Canadian art. Fee schedules, copyright information, and other invaluable information can be found on their website or through a provincial representative. The Cultural Human Resources Council has multiple studies on employment and careers in the Canadian culture sector. 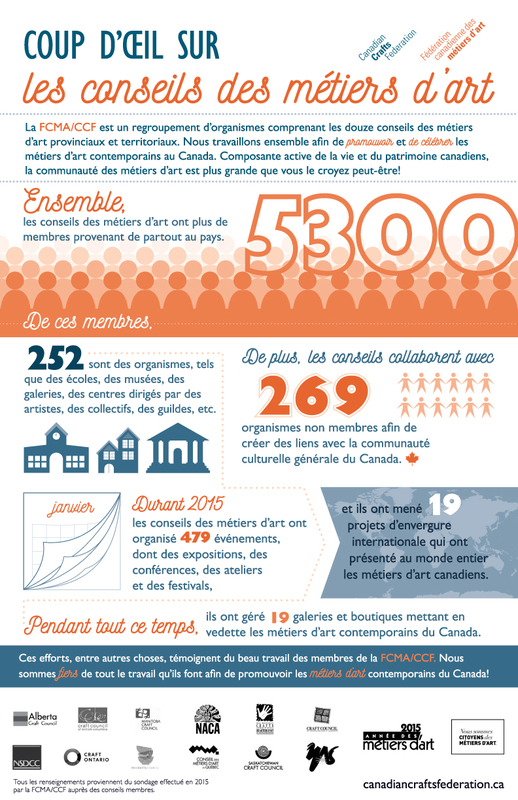 The CHRC also provides extensive information in both official languages about opportunities for cultural employment, including Craft. Here you can learn about what it takes to work in any given cultural field, browse Internship programs and Job opportunities, review research studies, and more. Of particular interest is the Art of Managing Your Career, a resource guide for cultural careers in all fields, with detailed information about the craft sector as a whole in both English and French. CERF+ (the Craft Emergency Relief Fund and Artist Emergency Resources) is the resource for craftspeople looking for information on emergency preparedness and and how to deal with a disaster. Information is available on their website about safeguarding, disaster planning, cleanup, salvage and e-salvage, and is freely accessible online to Canadians.